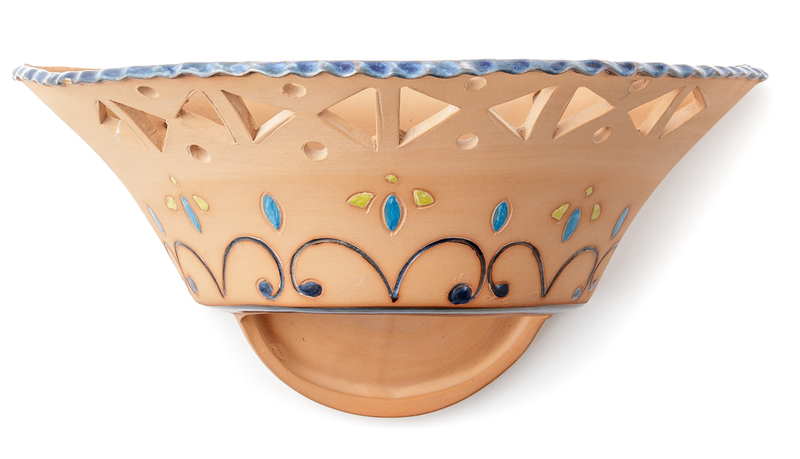 It combines the simplicity of terracotta with the preciousness of accurate fretwork forms, engraved with fine work of painted enamel decorations; the wall lamp is crafted entirely by hand with artisan expertise. 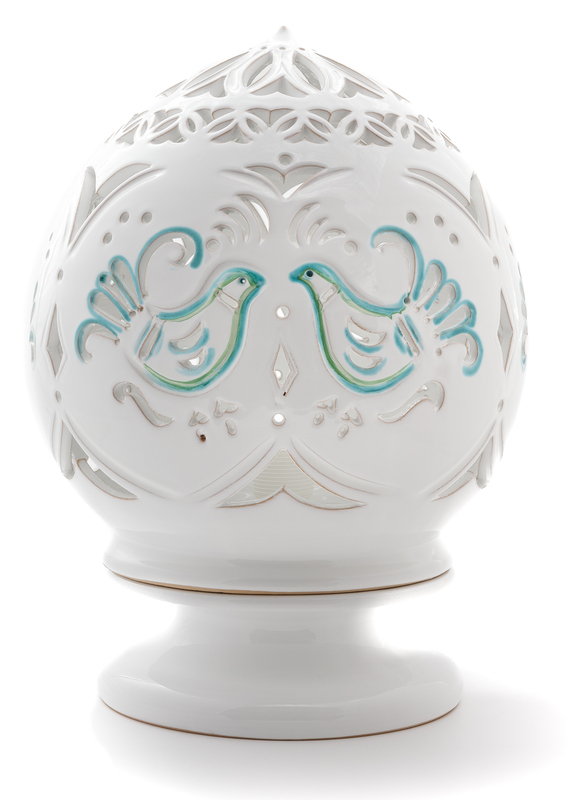 The lamp displays elegant and original shapes of glazed ceramic, consisting of two elements, a circular base and a fretwork top globe, richly decorated with a lapwing motif. Handcrafted, it is intended as a unique piece, with peculiar crafting details. 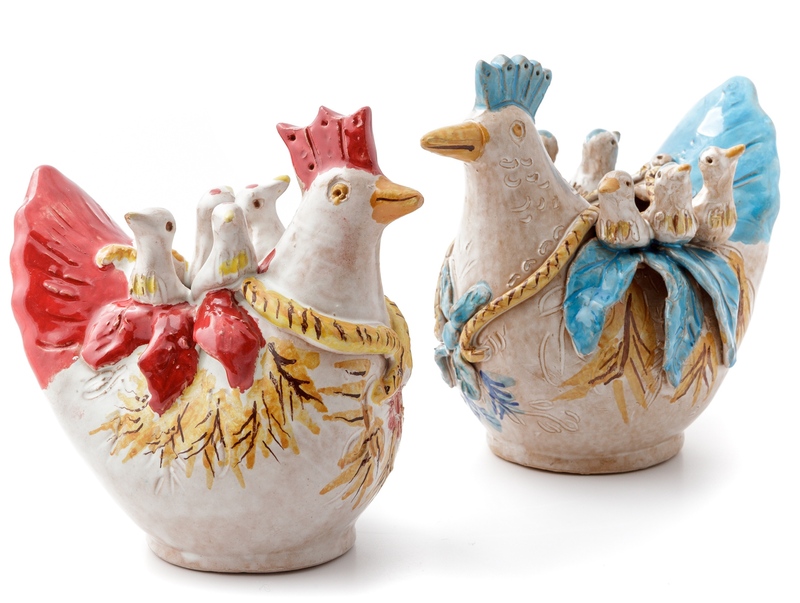 Gallinelle, displaying a decorative ceramic element inspired by the Sardinian tradition, are handmade glazed ceramic pieces with hand-molded details. Being objects of clear aesthetic value, they all display different crafting elements. The simple lines with triangular fretwork motifs of the wall lamp are embellished by the total glazing, skilfully crafted and with a carefully engraved pattern and painting of stylized lapwings. Being handcrafted, it expresses the uniqueness that accompanies the manufacturing procedures. 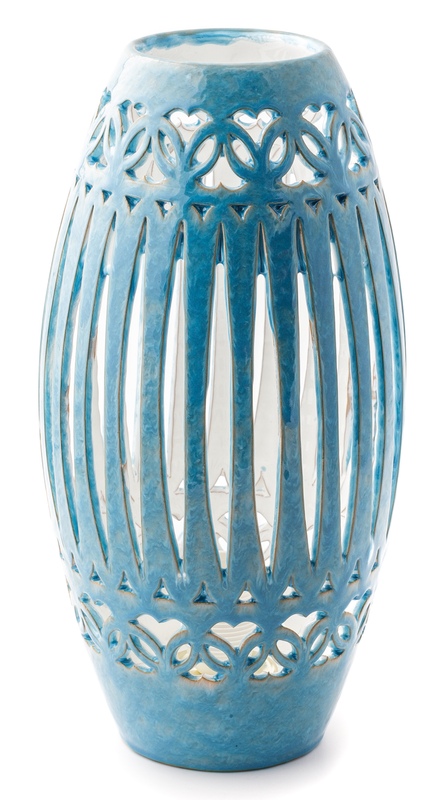 With its elegant and sophisticated crafting, the glazed ceramic lamp in vibrant turquoise material consists of one piece skillfully crafted with vertical grooves. Entirely handmade, it is an expression of high quality craftsmanship made by a skilful potter. Grazia Pastorino begins her experience as a ceramist at a social cooperative, where she continued her efforts into her own artistic project. After an intensive training period, during which she honed her skills thanks to the valuable lessons of skilled Dorgali potters, she became responsible for the cooperative pottery workshop, in her capacity of art director for about twenty years. In 2009 the activities of the cooperative evolved and Grazia decided work on her own, starting a workshop with an exhibition space in Nuoro, in front of the picturesque scenery of Mount Ortobene. Designs and suggestions related to the Sardinian tradition characterize the production, specializing in a wide and diverse range of lighting elements, customizable items, with countless variations of form and colours. The production consists of lighting elements for interior and exterior design, wall lamps, ceiling lamps, spotlights, lamp bases, as well as a wide range of home accessories such as plates, trays and other decorative items. Each artifact is customizable and coordinated with furniture sets particularly suitable for commercial and accommodation activities, as well as for private homes. In the workshop, she performs casting in plaster molds, crafted by her, in addition to fretwork. Glazing is performed by immersion and sponging, using the particular feature of natural sponges, on which to perform etching and brush decorations.